How to flip the downward trend of conventional outbound marketing efforts by implementing a strategy that attracts, educates and persuades prospects at each stage of the buying process. When was the last time you looked forward to a telemarketing call or enjoyed those annoying pop-up ads on a site you were trying to glean information from? How much of your direct mail do you open and how much goes directly into the trash? How about all the spam you get? People today are seekers of information on their own when they have a problem or need. The majority turn on their computer, smartphone or other hand-held device and look for answers to their problems or for products they want. Consumers are seeking information. Your job is to help them find it and help them solve their problems without annoying them. This is done through a process called inbound marketing which helps customers along their buying process, by providing them with answers to their most common questions, no matter where they are in the buying process. Inbound marketing is a process by which you attract customers through valuable online content that helps them solve their problems at each stage of the buying process. This can be done through various channels such as website content, blogs, videos, social media marketing, search engine optimization (SEO), and targeted paid advertising. 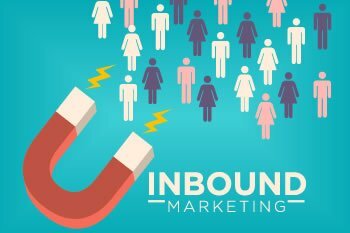 Inbound marketing differs from outbound marketing in that customers are drawn to your content and readily consume it because it’s helping them with their buying process and decision. Conversely outbound marketing seeks out the consumer through intrusive processes such as direct mail, pop-up ads, spam, and cold-calling. While many companies still use outbound marketing tactics, it is rapidly fading in effectiveness. Let’s look at the stages of the customer buying process. People take action when they are dissatisfied enough with something that they no longer wish to live a certain way or go without what they feel they need. This is the recognition of needs phase. In a simple example someone might be hungry, so they would seek food to satisfy their hunger. More complex business examples might include dissatisfaction with the company’s sales growth, an ineffective website or digital presence, a slow or inefficient business process, poor online marketing or the realization that their industry is rapidly changing, requiring an immediate response. Once our prospective buyer has decided their need must be met, they move on to stage 2 which is the search for information. People most often search online to find the products and services they need. They do this through blogs and websites, by asking friends through social media venues, searching online reviews of products and services, and putting together a list of alternatives that could meet their need. In stage 3 buyers evaluate alternatives they have weeded out from their research and proceed to make a decision. In this phase, they may search for more information on each alternative, exploring more in depth, in order to figure out the best solution. They are not quite ready to purchase, but they are getting to a place where they believe they have found the product or service that will meet their need. During stage 4 buyers usually have concerns that must be addressed before they are ready to purchase. This is often the stage where buyers will speak with a sales rep to clarify the product or service and get their concerns addressed. A robust, well-trained sales team will know in advance who their ideal buyers are and what their chief concerns are. Once these concerns are effectively addressed, many buyers will proceed with their purchase with confidence. If their concerns are not addressed, they will likely return to stage 3 and evaluate another alternative in order to make a different decision as to which product or service to use. Once buyers have purchased your product or service and have become your customer, stage 5 involves implementation of your product or service and of course the necessary support. At this stage it is critical for the products or services to work as the customer expected and for the implementation to go smoothly. In order to boost a customer’s confidence and build your reputation as a reliable company, it would be wise to follow up with your customers often to make sure they are happy and enjoying what they have purchased. If you would like to learn more about the customer buying process check out the book Major Accounts Sales Strategy by Neil Rackham. In order to help website visitors proceed through these five stages, you would need to provide content for them that helps them answer the questions they have at each stage. As they move through one stage and into the next, you greet them with content that is relevant to that very next stage of the buying process. While this all appears very natural to visitors on your website, little do they know the content has been carefully developed to aid and assist them, and to position you as a trusted source of helpful and valuable information. Stage 1: Recognition of Needs – You would have content on your website oriented around your target market’s most pressing issues, complaints and problems. This content would get visitors to realize that they are unhappy and should encourage them to take action to avoid further pain. It should also offer ideas and suggestions for what others have done to resolve the situation. Stage 2: Search for Information – In this stage, visitors want to drill down and learn all about their issue and what the potential solutions are. This is where you will provide much more in depth information about how your product or service can solve their problem better, faster, or cheaper than the alternatives. Stage 3: Evaluation of Options – This is where customers will be trying to evaluate different vendors and products. Content has to be oriented around 3rd party endorsements, testimonials and social proof. This will help the buyer feel confident that your solution is relatively low risk and will likely accomplish what they need. Here content would also cover the competitive advantage of your product or service, as well as the features and benefits of using your company. Stage 4: Addressing Buyer Concerns and Making the Sale – At this stage, a buyer may have all but made up their mind about your company but may still have lingering questions or concerns. You will want to address these concerns upfront, in FAQ’s, price sheets, expected delivery timelines, warranties, features, customer support, options, company reputation, and the like. It would not be uncommon for a customer at this stage to want to speak with a sales representative to clarify the more complex issues. Stage 5: Implementation and Support – Your website should showcase content that demonstrates how your products or services are working for other customers. Testimonials about the product or implementation can be effective. Posting information about any service level agreements and support plans is crucial. And of course, aside from supplying this content, customer service reps should periodically reach out to your customers to ensure your product or service is delivered, implemented and working properly. Follow up surveys can also help reveal issues that customers may not call and complain about. The above list provides the minimum specifications and content requirements for any business planning to upgrade or build a new website. To implement this process fully, you will also want to identify the different types of customers you have in your particular business to ensure you have content that speaks to each customer’s concerns. In the end your goal is to help educate and walk potential buyers through their natural buying process so that you can turn them into customers, repeat customers and ultimately ambassadors for your business. Once you’ve identified your businesses’ different buyer types and have created the content for each stage of the buying process, you will find that you will be generating more leads from your website than ever before. This is exactly what you want! However, many of these leads will not be “sales-ready” leads and will need further nurturing to guide them along. For example, if you have visitors downloading customer case studies and providing their emails to access that information, these leads may not be ready to speak with a sales rep yet. They may only be in “Stage 3 – Evaluating Options”. To call them now is going to annoy them and waste your time. So how do you know who to reach out to and when? Which leads are most important to contact? How engaged are my website visitors? What pages did each lead visit on my website and for how long? What content did they download? What do they want more information about? What information should I send next and to which lead? At what stage in the buying process are they? As the lead volume increases, there’s no easy way to efficiently keep tabs on all the accumulated data so that it can be distilled into a meaningful prioritized list of Sales and Marketing action items. This is where marketing automation comes into the picture. Marketing automation provides answers to each of the above questions and also helps you automate and keep track of all these actions. For example, let’s say a visitor comes to your site and spends time browsing certain pages. Marketing automation software will track the visitor’s activity on your site. Then at some point, the visitors may provide their email address in order to receive a free PDF download that interests them. With a marketing automation system embedded into the back end of your website, you can now see and track this user’s website activity, and if set up properly, this system can automatically flag where this visitor is at in the buying process at any time. Such systems can also dynamically present tailored content based on where they are at in the buying process or based on which pages they’ve visited on your website. And now that you have their email address, their contact info is automatically entered in your CRM. This information is associated with their activity on your website, which informs your sales team about the level of interest of this potential buyer and whether they are a good fit for your business. Most systems will have a way to automatically score users based on their level of engagement, how long they spend on your website, which pages and actions they take and so forth. When a user reaches a certain threshold or score, notifications can go out to your sales team to contact this user right away. You can even create complex rules and logic so that if a user does action A, then the system carries out action B. And once the visitor becomes a customer you can use the same system to follow-up through customer satisfaction surveys, up-selling, cross-selling, and cycle-based selling. You now have in place a completely automated system which get leads into a sales-ready state. As an entrepreneur you need to stay abreast of the most powerful and effective strategies and tactics out there. As technology gets more and more embedded into everything we do, it is disrupting and making obsolete the old ways of doing things. Ultimately it is up to you to ensure your business succeeds and expands. Your digital presence plays no small part in that process today. It has to be able to turn literal strangers into interested visitors, then into warm leads, and ultimately into paying customers who will eventually become ambassadors for your business. The good news it that this can all be accomplished through a comprehensive inbound marketing program. The days of outbound marketing are numbered and the new paradigm of inbound marketing is replacing it. Knowing the five stages of the user buyer process and how to effectively market to buyers at each stage is critical to your success in building your business. A carefully crafted website with content targeted around each stage of the buying process, along with a robust marketing automation system is key to integrating the inbound marketing process, making it possible for you to carry out these actions with precision, efficiency and effectiveness. Attract More Qualified Leads Through Inbound Marketing! Would you like to attract online customers rather than chase them down? Since 2003, we’ve been helping clients effectively market and sell their products and services online. We offer end to end digital marketing solutions to power your business. Request a Call or call us today at 727-562-5161. This entry was posted in Marketing and tagged Inbound Marketing. Bookmark the permalink. ← What is Inbound Marketing?